Beautiful Cotswold village in an area of outstanding natural beauty. Recently featured on BBC television "A Casual Vacancy" by J.K.Rowling. The opening scenes and the shop and other sites can be found by walking around the town. Built of mellow Cotswold stone from the local quarry on Painswick Beacon the town's many beautiful buildings can be seen as you wander around its quaint and narrow streets. 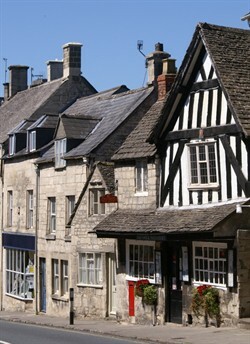 New Street, constructed around 1428 when the wool and cloth trade was flourishing, contained the oldest building in England to hold a Post Office, (recently closed) and Painswick's only example of exposed timber framing. Also Beacon House with its magnificent Georgian Frontage and the Falcon Hotel with the oldest bowling green in England. There are rare 17th century spectacle stocks near the court house. 14th century houses in Bisley Street include two original Donkey doors, Wide enough for panniered donkeys who carried the wool from the numerous mills along the local valleys. The church of St Mary (originally Norman) was extended around 1480 in the English perpendicular style. The churchyard with 99 yew trees (legend has it that the 100th won't grow) and unusual tabletop tombs is also famous for its 'Clypping ceremony' held in September. This ancient religious ceremony has nothing to do with the trees but is the embracing of the church by children of the parish carrying nosegays and singing hymns. 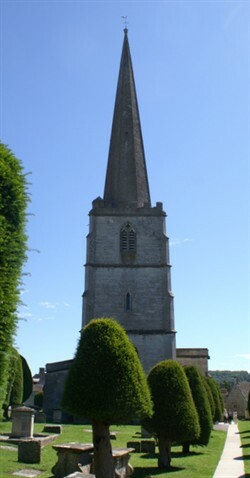 A closer look at the church tower still reveals traces of Painswick's role in the Civil War. Today there is a variety of small shops and galleries to browse around with pubs, restaurants and tea shops that serve good food. Painswick is a Fair Trade town. In early July Painswick puts on the Art couture festival. There are fantastic costumes paraded and stalls in the narrow streets. The Painswick centre always has art on show in it's artists studios. The Painswick Arts Festival runs for 6 weeks from middle of July to August bank holiday.bringing arts events to the village. Painswick is undoubtedly a village for all seasons what ever the weather; Its tranquillity and peace make for a wonderful holiday or weekend break, whether you are looking for a cosy log fire set in an original hearth in the winter or a delicious cream tea in the Summer. The countryside around Painswick with large areas of National Trust Woodlands is ideal for bird watchers and wildlife enthusiasts. Undulating areas of pasture land fall to the Wick stream which supplied the power for the woollen mills which can still been along its length. The famous Cotswold Way footpath which runs from Bath to Chipping Campden goes through the village. 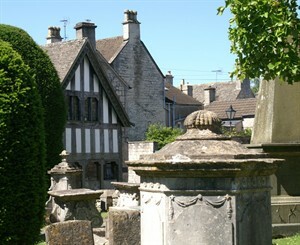 Painswick is about halfway along its 100 mile length and therefore useful for a stopover or longer rest. It is also an ideal starting point for many other delightful walks. Maps and leaflets are available from the Tourist Information Centre in the village. Painswick Beacon has magnificent views across the Severn Valley and on a clear day the Welsh Mountains can be seen. The outlines of the Iron Age Fort can be seen around the summit. There is also an 18 hole golf course. Squash club, riding stables and tennis courts are close by. The Slad Valley, made famous by Laurie Lee in his book 'Cider with Rosie' is also noted for its wild flowers as is Scotsquar Common at Edge. Edge, Slad and Sheepscombe are all villages within walking distance of Painswick and well worth a visit.